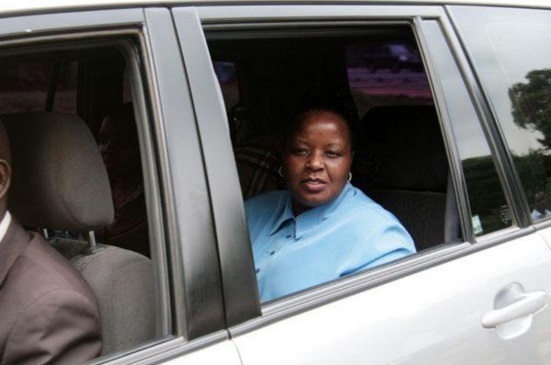 Bishop Margaret Wanjiru was among those who accompanied devolution CS Anne waiguru to the EACC office to be questioned by anti-corruption detectives over the loss of hundreds of millions of shillings in dubious procurement deals at her ministry. Ms Waiguru arrived at the EACC offices in Nairobi at noon and spent seven hours being questioned over the loss of Sh791 million from the National Youth Service (NYS), which falls under her ministry. Crowds of her supporters started gathering outside Integrity Centre, the headquarters of the Ethics and Anti-Corruption Commission (EACC), in the morning. Her lawyer, Mr Ahmednassir Abdullahi, arrived at EACC about 30 minutes before the CS who has been in the spotlight in recent weeks in the wake of corruption allegations in her ministry. Among the politicians who showed up at Integrity Centre to show solidarity with Ms Waiguru were MPs Moses Kuria (Gatundu South, TNA), Steve Kariuki (Mathare, ODM) and Ferdinand Waititu (Kabete, JAP). Former Starehe MP Bishop Margaret Wanjiru was also at the EACC offices. Last evening, Mr Abdullahi said that Ms Waiguru will "at best be a witness" in the case. Speaking to journalists soon after emerging from the eight-hour session, Mr Abdullahi said the CS had nothing to do with the alleged corruption at the NYS.